The European Chafer is a common white grub species that attacks lawns across many parts of Canada. It completes it’s life cycle in one year. The adult beetles lay their eggs in June and July. These eggs hatch in late July early August and the larvae begin feeding. This feeding continues into late fall before the white grub overwinters as a 3rd instar larvae. feeding takes place for a short period in the early spring until May when the larvae pupate into an adult beetle. The beetle emerges in June to complete the life cycle. The larvae has a “open zipper” raster pattern that distinguishes itself from other white grubs. The adult beetle is tan colour and measures about 15mm in length. 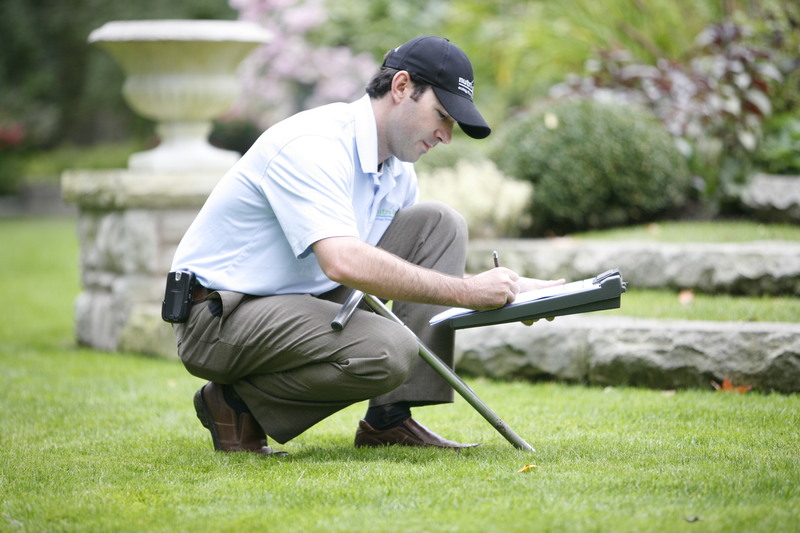 The Japanese beetle is a common white grub species that attacks lawns across Canada. It completes its life cycle in one year. The adult beetles lay their eggs in late July and early August. These eggs hatch in August and the larvae begin feeding. This feeding continues into late fall before the white grub overwinters as a 3rd instar larvae. Feeding takes place in the spring until June when the larvae pupates into an adult beetle. The beetle emerges in July to complete the life cycle. The larvae has a “V-shaped” raster pattern that distinguishes itself from other white grubs. The adult beetle has a metallic green head with copper coloured wings. Each wing has 6 tufts of white coloured hair along each side. The beetle measures about 13mm in length. The adult Japanese beetle can cause considerable feeding damage to trees, shrubs, flowers and other plants. The June beetle is a common native white grub species that attacks lawns across many parts of Canada. The life cycle of the June beetle is much more complex than other grub species such as the European Chafer and Japanese beetle. It requires three years to complete its life cycle. The larvae are much larger than most other grub species measuring 30-40mm in length. The adult beetles lay their eggs in late May early June. These eggs hatch in June and the larvae begin feeding. This feeding continues into late fall before the white grub overwinters as a 2nd instar larvae. In year 2, feeding continues as the larvae moves into its 3rd instar and overwinters. In year 3, feeding takes place until June as the larvae pupates into the adult beetle. The beetles lay dormant in the soil for the remainder of the year and overwinter as an adult. The adults emerge the following June to lay their eggs and complete the life cycle. The larvae have 2 parallel rows of hairs that distinguish its raster pattern. The adult beetle is reddish-brown to black colour and measure about 20 - 25mm in length.